The New York Times on Thursday issued a correction to an editorial after it was widely criticized for incorrectly linking the 2011 shooting of Rep. Gabby Giffords to a map circulated by Sarah Palin's political action committee which showed certain electoral districts under crosshairs. 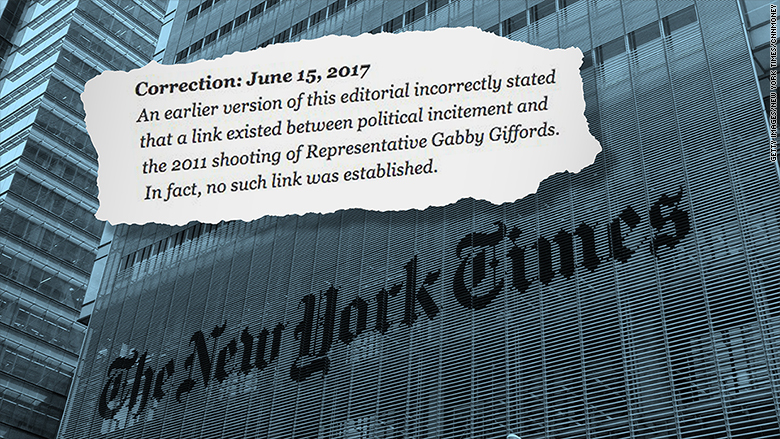 "An earlier version of this editorial incorrectly stated that a link existed between political incitement and the 2011 shooting of Representative Gabby Giffords," the Times' correction said. "In fact, no such link was established." In a tweet, the Times further added, "We're sorry about this and we appreciate that our readers called us on the mistake." The editorial, titled "America's Lethal Politics," implied that the man who shot Giffords, Jared Lee Loughner, was inspired by Palin's map. It further claimed that in the shooting of Rep. Steve Scalise and several others at a practice for a Congressional baseball game on Wednesday there was "no sign of incitement as direct as in the Giffords attack." The Times' editorial board is responsible for editorials such as this one, and the board is kept separate from the paper's newsroom and news coverage. That separation -- and the factual problems with the editorial -- was evident Thursday. A Times news story on the shooting that ran the same day as the editorial noted that "no connection" between the Palin map and Giffords shooting "was established." "The New York Times editorial board should start reading their own paper," tweeted John Ekdhal, a conservative blogger who pointed out the contradiction between the Times' reporting Thursday and the claim from its editorial board. In addition to the new newspaper's reporting Thursday, the news side of the Times had years ago provided ample evidence to suggest that Loughner was not motivated by the map produced by Palin's PAC, but was mentally ill and untethered from reality, and aware of Giffords independently. In an in-depth piece about Loughner in 2011, the Times reported, "Mr. Loughner seemed to develop a dreamy alternate world, where the sky was sometimes orange, the grass sometimes blue and the Internet's informational chaos provided refuge. ... He also may have felt rejected by the American government in general, and by Ms. Giffords in particular, with whom he had a brief — and, to him, unsatisfactory — encounter in 2007." The revised version of the editorial, nevertheless, continued to use the Palin map as evidence of "heated political rhetoric on the right," suggesting it showed how "vicious American politics had become." A sentence was added, however, to stress that "no connection" to the Giffords shooting and Palin map "was ever established." The line which said Wednesday's congressional shooting provided "no sign of incitement as direct as in the Giffords attack" was removed. On Thursday afternoon, after CNN sent a question to a spokesperson for the newspaper, the Times quietly revised another line of its editorial. Initially, even after the editorial was first corrected, it said Palin's map "targeted electoral districts that put Ms. Giffords ... under stylized cross hairs." The map circulated by Palin's super PAC never put the faces of Giffords or the other Democrats whose districts were targeted under crosshairs, but put the districts themselves under crosshairs. The editorial now says that the map "showed the targeted electoral districts of Ms. Giffords and 19 other Democrats under stylized cross hairs." At the time this article was first published, the editorial contained nothing noting that the sentence had been altered. A note explaining the change was later added. "The editorial has also been updated to clarify that in a map distributed by a political action committee before that shooting, electoral districts, not Democratic lawmakers, were depicted beneath stylized cross hairs," the updated correction said. In a statement provided to CNN by a spokesperson, James Bennet, the Times' editorial page editor, thanked CNN for calling the error to their attention. Of the larger issue with the editorial, he said, "While it's always agonizing to get something wrong we appreciate it when our readers call us out like this. We made an error of fact in the editorial, and we've corrected it. But that error doesn't undercut or weaken the argument of the piece." Critics disagreed and skewered the Times for continuing to stand by its editorial -- which was still featured prominently on the front page of its website Thursday afternoon -- after a key component of it was shown to be incorrect. Guy Benson, a Fox News contributor and editor for the conservative Townhall website, wrote on Twitter that "the mere mention of Palin's map is baseless, bizarre, irrelevant non-sequitur." Others suggested the Times should retract the editorial altogether. "This correction is so big, one might think they should just delete the entire editorial," tweeted Patrick Thornton, senior director of user experience and strategy at CQ Roll Call. "Kinda undermines the thrust of the entire editorial, no?" asked Tom Bevan, co-founder and publisher of RealClearPolitics.